Recommended Crops: Tomato, sesamum, black gram, red gram, green gram, Bengal gram, banana, tobacco, wheat, paddy, cotton, maize, barley, sorghum, oat, sugarcane, sugar beat, potato, brinjal, cauliflower, cabbage, onion, fruits, flowers medicinal plants etc. Dry Seed treatment: Mix 10 -20 g of Yash Derma powder per kg seed. Slurry seed treatment: Mix 10 -20 g of Yash Derma powder in 100 ml water per kg seed, shade dry seeds under before sowing. Soil Treatment: Field Application: Mix 1 kg Yash Derma powder with 50 kg of FYM in 3′ x 6′ bed, moisten and cover with polythene for 15 days (turn FYM and moisten 3-4 times), r 15 days after, spread over one acre land. For Orchard: Use 1 kg of prepared with FYM with 100 g Yash Derma powder per tree, two times per year before and after the monsoon. Nursery Treatment: with Mix 10 g Yash Derma powder in 100 liters of water and drench nursery bed to a depth of 10 cm immediately after sowing seeds. Tuber Treatment / Sett Treatment: with Mix 10 g Yash Derma dip tuber/sett for 15 minutes and dry in shade before sowing. Root Treatment: With Mix 10 g Yash Derma powder per liters of water and dip roots of seedlings for 15 minutes before transplanting. Keep Yash Derma always away from heat and sunlight. Don’t mix Yash Derma with chemical fertilizer or chemical pesticides. 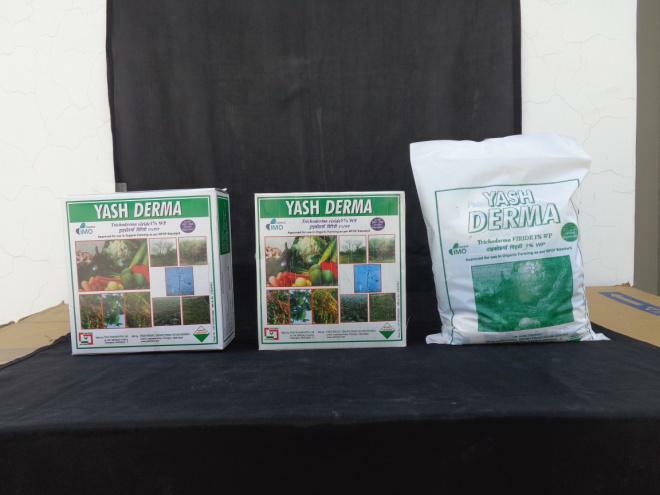 For best response of Yash Derma use with maximum organic manure.